THE heavy hand of famine was slowly closing on the Flat Head village. Red Beards from the North, who infested the jungle and the mountains behind the village, had waited in the forest for Flat Head hunters, and all too many of Big Tooth's best men had fallen victims to their sling stones. The goat herd was growing small with so many mouths to be fed, and the cane gardens were parched and dying because of a drouth. The water in the river was low for the same reason, driving the fish to deeper places where they were hard to net, and now as an added hardship the mussels, the food supply on which the Flat Heads had come to most depend on the mud flats, were fast being killed by low water, growing scarcer daily as one mud flat after another was exposed to the sun by the receding water, and baked hard and dry. Only one place remained within reach of the Flat Heads where mussels could be found, but death lurked there for any who ventured there to dig for them. A gray-black woolly rhinoceros had appropriated these last remaining mud flats as his water hole and wallowing place. He lurked there or nearby, constantly watching that section of the river bank, and woe betide any Flat Head who went there to dig for mussels. The woolly one's temper was short and the horns on the end of his snout were long, polished smooth and sharp with much threshing through thick thorn bush. So the Flat Heads went without their black-shelled mussels; that is, all but Pong, the devil doctor went without the shell fish. Pong, who had kept silent through all this growing famine, had mussels; all he wanted of them apparently. He had been seen by envious eyes to crack them between stones as he sat cross-legged by himself in front of his cave and sucked their contents from between broken shells. The shells had been seen there too when Pong went away from the village as he did at frequent intervals, so everyone knew it was river mussels he cracked between stones and not nuts from the forest. Pong had other things, too, that the Flat Heads envied him. He had new wolf skins, and skins of shaggy mountain goats to sit on or to pile into a corner of his cave in a thick, comfortable bed when others had none. Yet Pong was not a hunter. He was never known to work hard for anything, either, so it was unlikely, too, that he dug the mussels from the river. But even if he did bestir himself enough to dig them, where were the mud flats from which he got them? The only one within reach of the Flat Head village was the one guarded by the woolly rhinoceros, and it was not like Pong to venture where danger lurked. Pong lacked the courage. He was a drone; a parasite who lived only by selling charms and his so-called magic to those. who would buy them, and when people did not want his charms then he, perforce, went hungry or thought of some other easy way to make a living. But few among the Flat Heads believed in Pong, since Og and Ru and Tao, with the help of Big Tooth, the chief of the Flat Heads, had pretty thoroughly discredited him and his magic. So it became a. mystery as to where and how he got these mussels he was seen to eat so frequently. THE whole thing disturbed Og and Ru and Tao, and Big Tooth as well because they knew how much the people envied Pong his mussels. Indeed they were envious themselves and more than once as the four of them sat before their cave in the village, they pondered on how Pong came by the mussels and all the new skins in his possession. "It could be that he has found a new mussel flats somewhere else on the river, and keeps the secret to himself," suggested Ru, one evening. "Aye, it could be," agreed Og, "but that does not tell us how he comes by all the new skins; the black wolf skins and the goat pelts." "Black wolf skins are from the cold country, Og," suggested Tao, "'could it be that this devil doctor sells his charms and medicines to the Red Beards of the North? Could they be paying him in mussels and skins for some magic he makes for them?" "Ho? That be what Big Tooth has thought about, Tao," said Big Tooth, as he reached for an old marrow bone beside their cooking fire and hopefully cracked it open with his stone axe. "I have had those thoughts, too," admitted Og. "The Red Beards are savage fellows, but they are full of fear of the things they do not understand. They may believe in Pong's magic." "The Red Beards' village is far to the North, many marches of the sun, you do not think he goes there to sell them magic?" queried Ru. "He could meet them in the jungle," said Og. "Pong leaves his cave often now, and goes into the jungle. It is when he comes back that he brings with him these mussels and wolf skins. I know because I have watched him go and come, and though he tries to keep his going and coming a secret yet I have seen what he brings back with him each time." "Ho. If this devil doctor makes friends with the Red Beards, this be bad for my people. One day Pong may for a few wolf skins show the Red Beards the way into the valley of the Tree People and they will fall upon us and kill us all," said Big Tooth. "Aye. He is treacherous enough for that. It would be well if we followed that fellow into the jungle. Keep a sharp eye on him and next time he leaves the caves we will follow him as closely as his shadow." "We will not have to wait long, Og," said Tao, confidently, "I have kept count. As many suns as there are fingers on my right hand he waits here, then he goes forth. It is the same day each time, and to-morrow is the day." "Hi-yah! This is good, Tao. We will watch him to-morrow then," said Og. True to Tao's prediction, before the sun rose above the mountains behind the Flat Head village, next morning Pong, wrapped in his bearskin robe, came cautiously forth from the doorway of his cave, and surveyed the slumbering village. 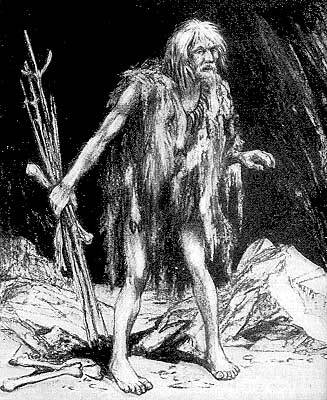 Then silent as a shadow he stole down the path to the jungle, carrying a strange contrivance of sticks and goat skin. BUT he had not gone far before four figures glided silently but swiftly from Og's cave into the jungle to follow	the same game trail the devil doctor traveled. It was not an easy task to keep up with the medicine man, however, for once in the jungle he moved along at a rapid pace, like one late to keep a meeting. He traveled up the river toward the mussel flats, too, but as he approached that quarter, instead of swinging riverward he took a trail up toward the rocky hillside that was the retreat and the feeding ground of the woolly rhinoceros. He did not approach too close to the hill side however. Indeed he stopped among rocks some distance away where grew poisonous red-leaved kai bushes, and there, sitting with his back against a boulder, he crushed some of the red leaves between his scrawny fingers. Then he bathed the goat-skin thing on sticks he carried, with the pungent poisonous blood-red juice of the kai plant while he muttered some strange incantations. All this Og and Ru, with Tao and Big Tooth, saw watching from behind boulders some little distance, but before they got the full meaning of all Pong was doing the sound of men moving in jungle came to them. Presently a group of Red Beards emerged from the bush and approached the rock against which Pong sat. Og and his companions realized then they were soon to know more about Pong's treachery and crouched tense and alert. The leader of the Red Beards was Lost Ear. Og knew him of old as a savage fellow. He had an ugly face and beetling brows, and Pong seemed none too comfortable nor too confident when he approached the devil doctor and spoke to him. "This day," said Lost Ear, "we come for many mussels from the Flat Head river. Is the charm to keep the woolly rhinoceros away from the mud flats while we dig them ready?" "Aye it is ready, Lost Ear. Look you, I have just made medicine over it. It is bathed in the poison red juice of the kai bush, which is the one thing the woolly one fears. The kai bush poisons the children of the rhinoceros. He avoids it. With this charm I will block the trail through the thorn bush to the river and the Woolly one will not come down to the water to drink or to wallow in the mud until I remove it." "This is well, Pong. But be sure it works, for if it fails, death will be your penalty," said Lost Ear as his eyes hardened. Pong looked at him nervously for a moment, before he spoke. "It will not fail Lost Ear. It has not failed yet, has it? My magic is strong. Some day you will know how strong it is and you will want me to come and live among the Red Beards and be your devil doctor. But do I get my price for it this time too?" "Aye. A wolf skin filled full with mussels will be yours after we have dug them; and you get three goat skins besides. We have brought the goat skins. Here they are." Lost Ear pitched the goat skins at Pong's feet. "The mussels we bring back from the river. We go now." "All is well. Go, but on the river bank wait until the sun shows above the trees across the river before you go to the mussel flats. That will give me time to place my charm and make my medicine." LOST EAR nodded and grunted as he and his men made their departure toward the river. Pong watched them go, then laughing softly to himself he took the goat-skin charm he had made and glided off through the bush and up toward the thorn-grown hillside that was the hiding place of the woolly rhinoceros. And Og and Ru with Tao and Big Tooth glided after him, keeping carefully to cover and working themselves into a position where they could watch Pong. The medicine man followed a game trail through the thorn thicket until he was well in the heart of it. Here he came to a break in the thick shrubbery which seemed to be the fork of two trails  wide, well-tramped trails that were the especial runways of the woolly rhinoceros. One trail led off across country and the other down to the river. Here in the center of the trail that led directly down to the river Pong planted the charm, pressing the stick deep into the earth with the red-dyed goat skin flapping in the wind. A moment he paused to mumble some jibberish and make a few strange motions with his hands over the charm, then he scuttled back into the thick bush. "Ho, this Pong does for the Red Beards, but he does not do it for Flat Heads," said Big Tooth scowling his anger. "Aye, he does it for the Red Beards to gain their favor. You heard him tell Lost Ear that some day the Red Beards would know how strong his magic is and would ask him to come among them and be their devil doctor," said Og. "Well, that is what he hopes will happen, for now that the Flat Heads have lost faith in his magic they will not pay him meat and mussels for his medicine." "Ho, if we can get rid of Pong so easily it would be folly then to make the Red Beard lose faith in his magic," said Tao. "What do you think of, when you speak that way?" asked Og, looking at Tao searchingly, for he felt a hidden meaning in what Tao said. "Why now," replied Tao, "if this charm that works were to be put at the beginning of that other trail instead of the river trail where it is, the woolly one would be sure then to take the river trail to get his drink and come upon the Red Beards digging our mussels." "Hi-yah! There is a thought! Who cares if the Red Beards lose faith in Pong. We should teach them that they cannot come to the Flat Heads' river and dig their mussels. We will move that charm from the river trail to the other trail, then we will go down to the river and see what happens." "Ho, it is a good thought," said Ru, while Big Tooth nodded and grinned broadly. A moment they paused to scan the thicket for signs of the rhinoceros, then all four crept silently out of the bush into the path to the river. There they pulled up the sticks that held Pong's charm and moved the fetish to the mouth of the other trail that led off cross country, blocking it and leaving the path to the woolly one's drinking place clear. Then like four shadows they moved through the thick jungle growth toward the river. IT WAS a long way down to the river through thick jungle country and Og and his companions could not travel fast, nor dared they travel carelessly, for any noise they made in the bush might reach the ears of the Red Beards at the river. The sun was well above the tree tops on the far shore when they finally reached the jungle fringe along the edge of the mud flats and lying flat behind some high hummocks looked out upon the marsh. The Red Beards were hard at work on the mud flats. As many men as one had fingers on both hands were out there in the mud with long poles digging up the black shelled mussels, and filling goat-skin pouches they carried slung about their necks with thongs. They were having a good time too, for it was not unpleasant walking in the mud and water with little danger from crocodiles, who kept to the deeper parts of the river. The woolly one was unusually long in making his appearance for his drink this morning. The Red Beards filled goat skin after goat skin with mussels and dumped big piles of the black-shelled river clams on the shore. Indeed Og began to be afraid the Red Beards would gather all they could carry and be finished with their work before the rhinoceros appeared in all his wrath. Ru and the others grew impatient too. "I do not believe the woolly one is coming for his drink this morning," he told Og. "These Red Beards are going to get away with all their mussels unharmed." "Aye. And they will still believe in the power of Pong's charm too," added Tao. A little longer they waited in silence. Then Ru spoke again. "Og, my fingers itch to send an arrow at some of those fellows out there. If the rhinoceros does not come to punish them let us lay a few low. We could easily put a shaft through old Lost Ear himself from here. Look, I have an arrow strung. Shall I send it at him?" "If you try that Ru, I will give you such a cuffing as you never had before. One shaft at those fellows and we would have all of them down upon us. I have an arrow strung too, but it is only in case we have need of it. Wait a little longer and..."
But Big Tooth interrupted Og with a soft hiss. "Shus-s-s-s," he warned, "Big Tooth hears something." Instantly all four tensed, for even as Big Tooth spoke they too caught the sound of some great body moving stealthily through the underbrush. Instinctively their eyes shifted toward the point where the rhinoceros trail came down to the water's edge and even as their gaze focused there the big form of the woolly one seemed to materialize as softly as a phantom. There he stood, statuesque, silent, with his great round mound of a back clothed in shaggy hair, his big ears cocked forward, his two-horned head up, and tiny eyes showing red and savage as they looked out from between folds of skin. "Hi-yah! The woolly one has come!" whispered Og softly. "And the Red Beards do not even know he is here, so quietly has he moved," added Tao. "Ho, now we shall see plenty trouble for somebody," breathed Big Tooth. Then suddenly he emitted a grunt of surprise, for like a bolt of lightning the woolly one changed from a silent statue to savage action. With a shrill, trumpeting squeal that tapered off into a loud blowing snort, the big beast hurled his heavy body forward on his short legs; lowering his ponderous head with its gleaming horns he hurled himself down the river bank and into the mud and water, heading straight for the mass of Red Beards up to their thighs in the clinging slime. IT WAS a terrible charge. Not until the woolly one blew that trumpeting blast were Lost Ear and his men aware of the presence of the savage beast, and when they did become aware of him it was too late for many of them, since the great creature was already plunging down among them. With wild yells the frantic Red Beards sought to scatter and drag their legs out of the clinging ooze in a mad effort to reach the solid shore. But while they yelled and struggled the woolly one reached the nearest of the mussel hunters, and hurling himself among them, hooked in every direction with his terrible horns. The result was a spectacle that made even Og and his companions turn pale and catch their breath. Red Beards, horribly ripped open by that ruthless snout with its ugly armament, were hurled high in the air to fall limp and lifeless into the slime or into the water of the river beyond, there to become food for the waiting crocodiles. Right and left he swung his heavy head each time with a twisting upward thrust, and each time those horns found victims, some to be killed outright, others to be maimed and knocked down, and trampled under sharp hoofs. Some of the Red Beards gained the shore and fled into the forest, others, desperate, waded further out to plunge into the dark brown, sullen water of the river where they found a horrible fate in the jaws of the river crocodiles that rose silently from the depths and dragged them under. It was a terrible spectacle and though it lasted but briefly it left a vivid picture on Og and his companions. 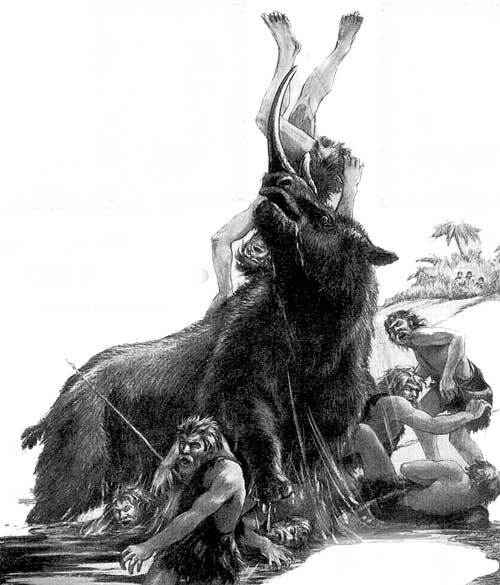 Indeed, by the time the last Red Beard that could flee the mud flats had disappeared, and the beast, still snorting and blowing, came wading out of the mud to the solid shore, all four watchers were sick with fear themselves. And when the rhinoceros, with woolly coat dripping mud and slime, stood on the river bank and scanned the bush and the shore line with his savage little red eves while he emitted grunting snorts of anger, Og and his companions flattened close to the ground in their hiding place in the brush, nor dared they as much as move a muscle for fear of betraying themselves to this savage one out of the jungle. It was not until the rhinoceros had been gone a long time, fading up the path through the thorn thicket as silently as he had come, that they even turned their heads to look at one another. "Hi-yah! What a beast that fellow is!" muttered Og as he licked lips gone dry with fear. "Aye. And how he made those Red Beards pay for stealing the Flat Heads' mussels," added Ru huskily. Tao laughed nervously. Then he spoke. "Even a charm that works may fail sometimes," he said. "Lost Ear and his Red Beards found that out to their sorrow this day. But they did gather many mussels which they have left on they bank there. Let us take them back to the village. They will make the hungry people happy." "And when they have all had enough to eat let us call a council and plan a way to dig a pitfall to kill thus woolly one as we killed the mastodon. Then the Flat Heads will not need to go hungry for mussels any longer," said Big Tooth. It was little work for Og and his companions to gather up the mussels that the Red Beards had left piled on the river bank, and presently they were moving through the jungle toward the Flat Head village, each with a great load of the prized shell fish. But as they passed the rock where Pong had made his medicine and met the Red Beards, they paused at signs of another jungle tragedy. There on the ground they found trampled goat skins, a riddled bear-skin robe and signs of a hard struggle, indicating that the Red Beards who had escaped the wrath of the woolly one had come back to settle with Pong for the failure of this charm of his in which they had put so much faith. There was blood on the ground and on the rocks and even on the red kai leaves of the bush that stood near by, but there was no sign of Pong's twisted body, which made Og and his companions believe that the devil doctor had been beaten to unconsciousness, and carried off by Lost Ear's men to their distant village, there to be held a slave or sacrificed to some one of the many horrible gods the Red Beards worshiped.